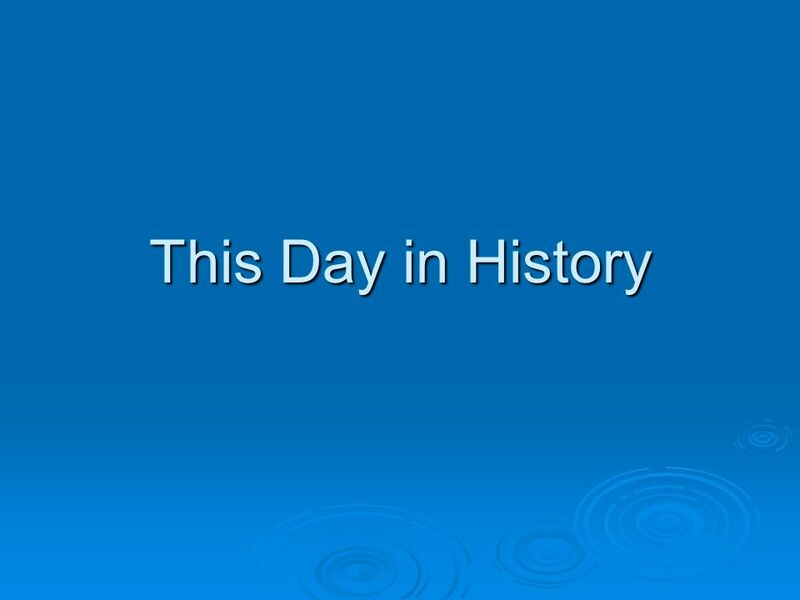 This Day in History. Directions Displayed for you will be a word, name, or phrase. Displayed for you will be a word, name, or phrase. In the Journal section. 2 Directions Displayed for you will be a word, name, or phrase. Displayed for you will be a word, name, or phrase. In the Journal section of your binder on a piece of paper write todays date. At the top of the paper write This Day in History. In the Journal section of your binder on a piece of paper write todays date. At the top of the paper write This Day in History. 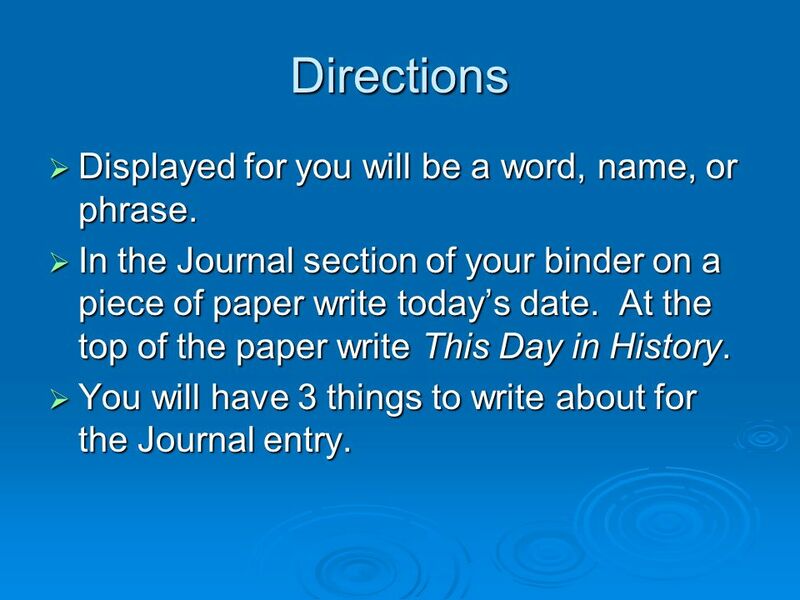 You will have 3 things to write about for the Journal entry. 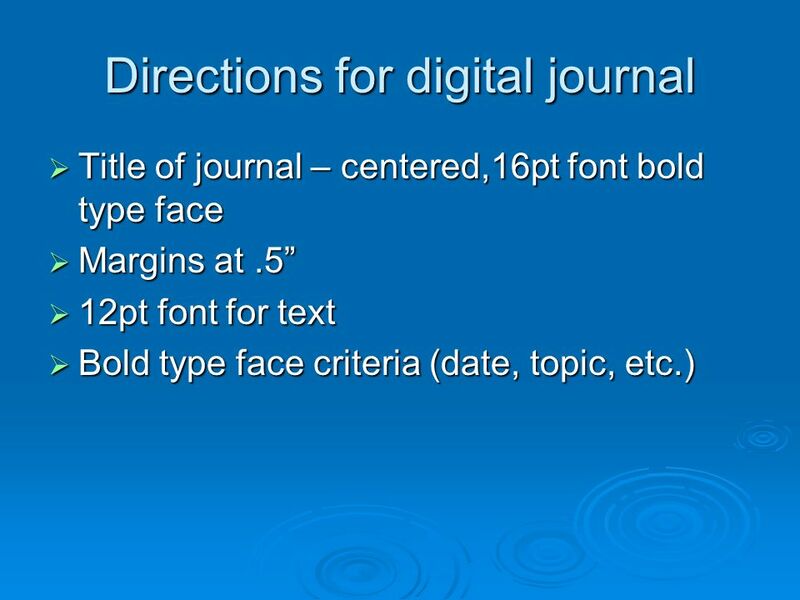 You will have 3 things to write about for the Journal entry. 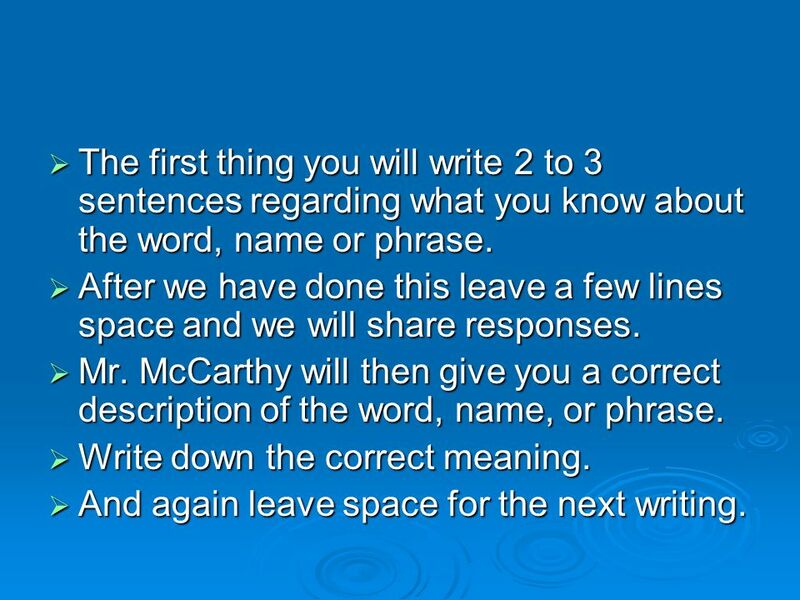 3 The first thing you will write 2 to 3 sentences regarding what you know about the word, name or phrase. The first thing you will write 2 to 3 sentences regarding what you know about the word, name or phrase. After we have done this leave a few lines space and we will share responses. After we have done this leave a few lines space and we will share responses. Mr. McCarthy will then give you a correct description of the word, name, or phrase. Mr. McCarthy will then give you a correct description of the word, name, or phrase. Write down the correct meaning. Write down the correct meaning. And again leave space for the next writing. And again leave space for the next writing. 4 For the final part of the assignment we will discuss as a class and Mr. McCarthy will give you several facts, pictures or video. 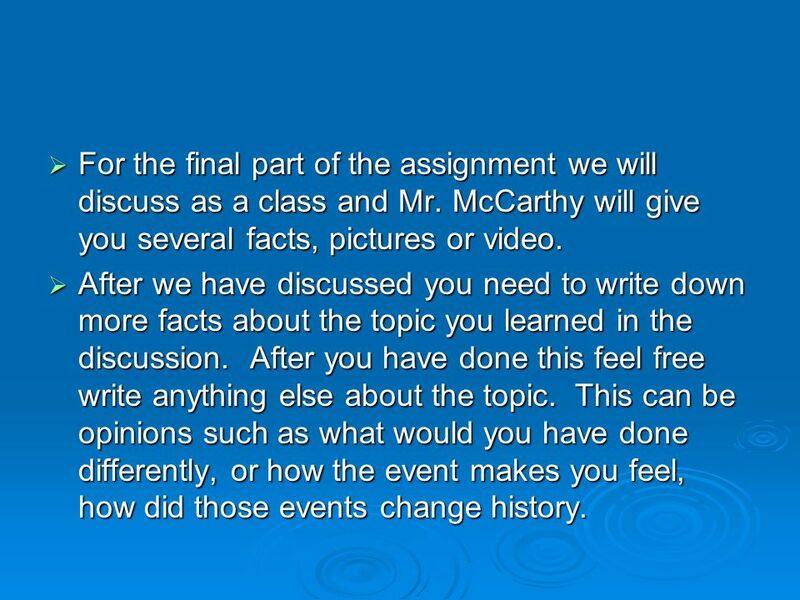 For the final part of the assignment we will discuss as a class and Mr. McCarthy will give you several facts, pictures or video. After we have discussed you need to write down more facts about the topic you learned in the discussion. After you have done this feel free write anything else about the topic. This can be opinions such as what would you have done differently, or how the event makes you feel, how did those events change history. After we have discussed you need to write down more facts about the topic you learned in the discussion. After you have done this feel free write anything else about the topic. This can be opinions such as what would you have done differently, or how the event makes you feel, how did those events change history. 5 You should have half of the page covered or more. You should have half of the page covered or more. These will be graded several times throughout the quarter. These will be graded several times throughout the quarter. Shall we do one for fun?? Shall we do one for fun?? 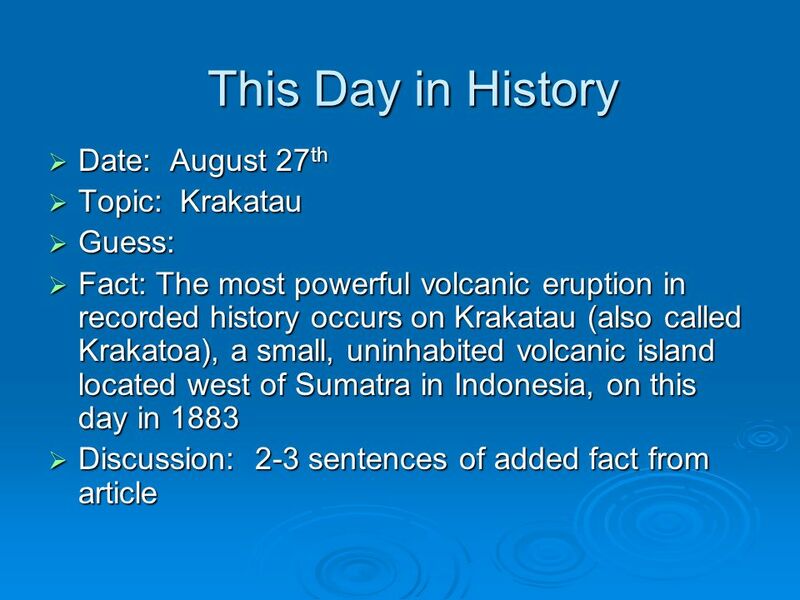 Download ppt "This Day in History. Directions Displayed for you will be a word, name, or phrase. Displayed for you will be a word, name, or phrase. In the Journal section." 4.05 Apply correct report format. 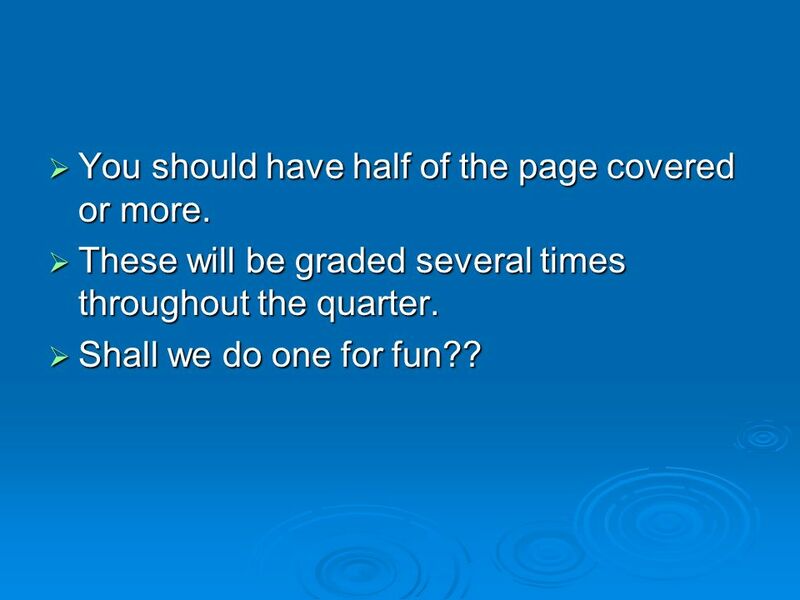 MLA FORMAT / CITATION Lit and Comp 1H Ms. Whitlock. Mrs. Kercher 6 th Grade Gifted.  ExploraVision is a competition for K–12 students of all interest, skill, and ability levels. The competition encourages. When you are writing an essay. Thesis/topic sentences Concrete details Commentary when you are writing an essay. Instructions for completing the ES089g term paper. Title Page, Process Paper, and Annotated Bibliography Rules Checkpoint #3. 1.Grab pink paper while walking into class. 2.Take out homework (multiplication puzzles). 3.Time for a Math Materials Check: You need your math binder. Jane Doe PowerPoint assignment for FAM 332 April 27, 2015. Grade 7 Advanced Reading.  Standard: LFAS.7.RI.2.5 Analyze the structure an author uses to organize a text, including how the major sections contribute. Term 2. New Notebook Organization We will begin this quarter to organize our notebooks according to page numbers. We will keep a table of contents and. Title Slide Digital Portfolio on Tolerance Name Date. Welcome to with Mr. Serino. Introduction Mathematical Decision Making (MDM) The main intent of the course is to supply students with the skills necessary.